Jul - 24 | By: Lexy Garbarino | no comments. 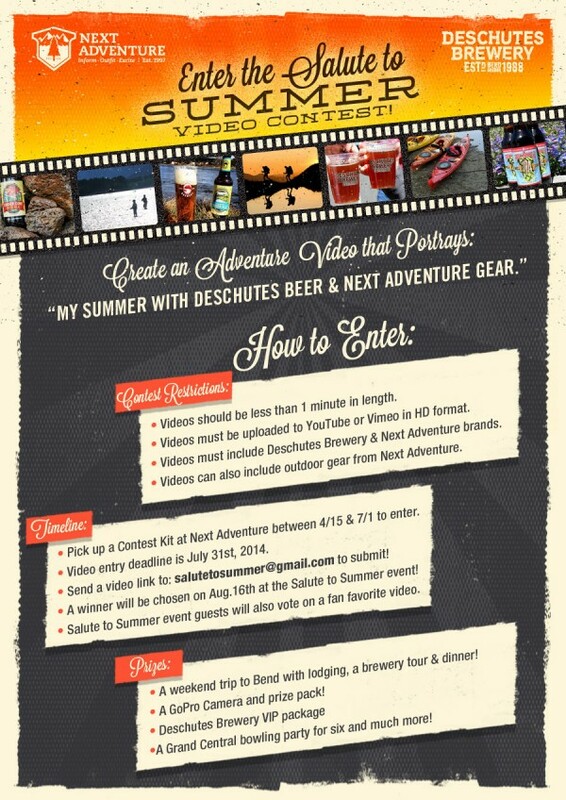 Next Adventure, Deschutes Brewery and Grand Central are holding a video contest for the Deschutes Salute to Summer event in August and want to spread the word! Submit a one minute video of Your Summer with Next Adventure Gear and Deschutes Beer and your video could be chosen to play at the event with the grand prize opportunity of a VIP weekend to Bend, OR and a GoPro! The deadline for entry has been extended to August 10th! See further details below. At the Salute to Summer Event on August 15th over 500 people will watch the top videos on over 20 TVs at Grand Central including four 16ft projection screens! The crowd votes for their favorite, therefore, the more friends you bring…the better chance you have of winning! Email [email protected] with questions, show us your Summer Adventure!